Joe Biden scored a hit in last night’s vice-presidential debate after Paul Ryan dropped the name “Jack Kennedy” to defend Mitt Romney’s proposed tax cut. “Oh, now you’re Jack Kennedy,” he quipped. Political commentators delighted in the reference to Lloyd Bentsen’s famous put-down in his 1988 vice-presidential debate with (the similarly much-younger) Dan Quayle. Quayle, you’ll recall, said he had just as much political experience as “Jack Kennedy” had when he sought the presidency. That prompted Bentsen to reply: “Senator, I served with Jack Kennedy. I knew Jack Kennedy. Jack Kennedy was a friend of mine. Senator, you're no Jack Kennedy.” Even as vice-president, Quayle never really recovered from Bentsen’s pointed dismissal. In their rush to declare Biden the victor in that exchange, however, the commentariat missed an opportunity to address the substance of what Ryan was saying, which was significant. Let’s review. Biden had just gotten done beating up Ryan for refusing (as Mitt Romney does) to say precisely which tax loopholes Romney-Ryan would close in order to--as promised--recoup all revenue lost by lowering all marginal tax rates by 20 percent. Ryan. It is mathematically possible. It's been done before. It's precisely what we're proposing. Biden. (Chuckles.) It has never been done before. Ryan. It's been done a couple of times, actually. Biden. It has never been done before. Biden. Oh, now you're Jack Kennedy. It was smarter for Biden to shut Ryan down with the Jack Kennedy crack than to explain why the Kennedy tax cut doesn’t help Ryan’s case. That's because establishing why requires much more explanation than Biden had time for. Me, I’ve got nothing but time. So here goes. In 1964 Congress passed, and Lyndon Johnson signed into law, a big income-tax cut that had originally been proposed by John F. Kennedy. The top marginal rate dropped from 91 percent to 70 percent, which represented a 23 percent cut. The bottom rate dropped from 20 percent to 14 percent, which represented a 30 percent cut. The middle rates dropped from 59 and 62 percent to 45 percent, which represented a cut of 24 percent to 27 percent. So we start out with one significant difference between the Kennedy and the Romney plan. Romney and Ryan want to lower taxes by the same amount for all brackets, high and low. Kennedy (really, Johnson) lowered taxes more at the middle and especially at the bottom than he did at the top. 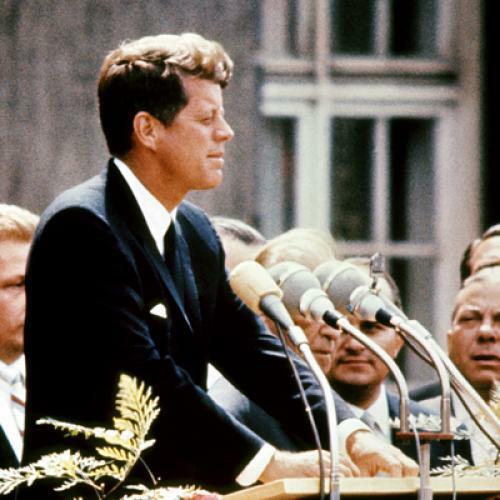 The 1964 tax cut has been embraced by supply-siders as a supply-side cut, and JFK even sold it that way to big business in a 1962 speech that supply-siders love to quote. But in fact Kennedy, and his chief economist Walter Heller, saw the tax cut as a demand-side cut aimed at creating old-fashioned Keynesian stimulus in a sluggish economy. Indeed, what Kennedy really wanted was to stimulate the economy through government spending, but he didn’t have the votes in Congress for that. So he went with the tax cut instead. The giveaway that Kennedy's wasn’t really a supply-side tax cut was that the cuts were greater in the middle and at the bottom than at the top. If you want to stimulate consumer purchasing, you’re better off concentrating income-tax cuts in the middle and at the bottom. If you want to stimulate investment, you’re better off concentrating income-tax cuts at the top—or, if that’s politically impossible, you make the cuts the same across the board. Ronald Reagan’s tax cut in 1981 was pretty obviously a supply-side cut because it lowered the top tax rate more than it did rates at the middle or the bottom. After it passed, White House budget chief David Stockman got in a lot of trouble for admitting what was obvious to anyone paying the slightest attention: The only cuts Reagan cared about were those at the top. "It's kind of hard to sell 'trickle down,'" Stockman blurted out to William Greider in the Atlantic, "so the supply-side formula was the only way to get a tax policy that was really 'trickle down.' Supply-side is 'trickle-down' theory." If Ryan means to suggest that the 1964 tax cut paid for itself, that’s definitely not true. Despite what many supply-side fantasists maintain, tax cuts always deprive the Treasury of revenues, and the ’64 cuts were no exception. Whether the Kennedy-Johnson tax cut achieved its desired economic stimulus is a matter of some dispute. Bruce Bartlett was, in 1981, staff economist to Rep. Jack Kemp, R-N.Y., an architect of the big Reagan tax cut (and also Ryan's mentor). Bartlett gave the 1964 cut close study at the time. He says it recouped about one-third of its revenue loss through economic stimulus. But according to a recent Congressional Research Service survey, there’s no clear evidence that tax cuts have ever stimulated economic growth, going all the way back to 1945. Ryan is right that the 1964 cuts were achieved without the elimination of any tax loopholes benefiting the middle class. But to paraphrase Bentsen: “I knew 1964. 1964 was a friend of mine. 2012, you’re no 1964.” Most obviously, the economy was in much ruder health in 1964 than it is today; even allowing for the slowdown Kennedy wished to address, the postwar boom was in full swing and annual GDP growth rates were, through the 1960s, much higher than anything we’ve seen lately. For another, the top marginal rate fell from 91 percent, which probably was too high, to 70 percent, a level that Ryan nor Romney would never, ever tolerate (but which, in case you're curious, lies within the optimal range of 57- 83 percent identified by the economists Thomas Piketty and Emmanuel Saez). Possibly the most significant difference, though, is that in 1964 the Treasury wasn’t as dependent on rich people for revenue as it is today. This last point is easy to misconstrue, and conservatives have done their best to turn it into an argument that the rich are paying more taxes than ever before. That isn’t true. As a percentage of their income, they’re paying much less than they did then; the top marginal rate is today half what it was after the ’64 tax cut. But as a percentage of the Treasury’s total take, they’re paying more. The top one percent, for example, pay (very roughly) a little more than one-third of it, which is more than twice the percentage they paid back in 1964. Why has their share of the national tax bill doubled? Because their share of the national income has doubled from about 10 percent in 1964 to about 20 percent today. The more income you have, the more income tax you’re going to pay, even if the top rates (and the capital gains rate and corporate tax rates) are falling. Today's grotesquely lopsided income distribution explains why any uniform reduction in tax rates (say, Romney's proposed 20 percent) is really a tax cut for the rich in disguise. A 58 percent majority of all income tax is paid by the top 5 percent (i.e., families making more than $155,000) and fully 70 percent of is paid by the top 10 percent (i.e., families making more than $112,000. When rich people pay most of the taxes, rich people get most of the tax cuts. If conservatives want the rich to pay a smaller share of the nation’s collective tax bill, they should forget about eliminating the Earned Income Tax Credit—that’s small potatoes—and instead figure out a way to revive the middle class, which was thriving in 1964 (therefore paying a much larger share of America's taxes) but is sagging today. And no, Rep. Ryan, showering rich "job-creators" with ever-larger tax cuts won’t achieve that. (We know because we’ve been trying that for the past 50 years.) The way to reduce the rich’s share of the nation’s taxes is to reverse the 33-year trend toward growing income inequality. I have a few ideas about how, but Ryan won’t like most of them.